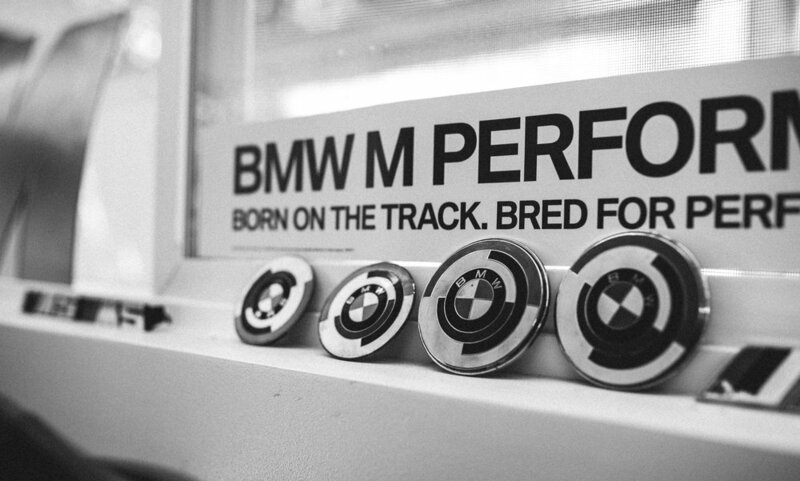 Ask almost any BMW lover what their favorite car is, and you’re bound to get at least a few answers. Most often the various M3 or M5 generations come up as fan favorites. Such is the case for Carlos, who has fostered an adoration for the M3 throughout most of his life. 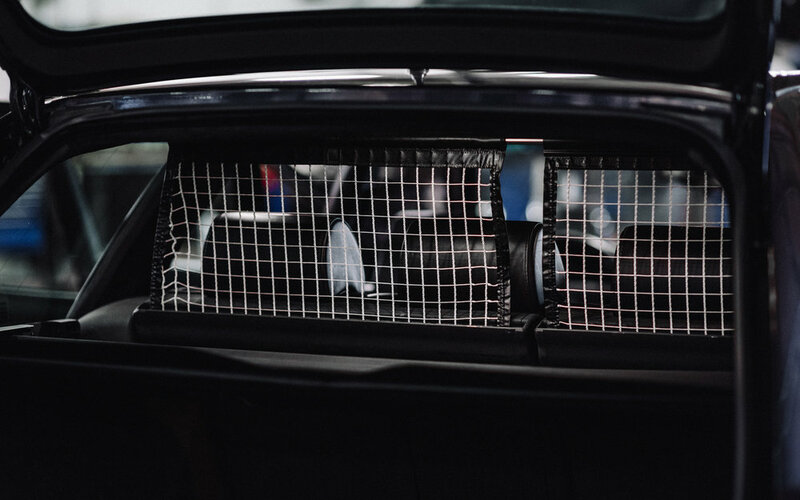 Recalling his young teenage years, he was introduced to the first M3 he drove: the E30 M3. It was one of those “love at first drive” moments, and he soon realized that he was addicted. Then came the E36 M3, which sealed his automotive fate. Today, with eight cars and years of automotive obsession under his belt, Carlos finds himself in a state of contentment—or, as content as a constant builder can be. He owns an incredible E30 M3 + E36 M3 pair, but for now, let’s take a look at the E36. This car comes as a “take two” of sorts, as Carlos’ first E36 M3 met an unfortunate end at the hands of an uninsured, unlicensed driver who disregarded a stop sign at roughly 40 MPH. The fortunate part of this experience is that Carlos walked away comparatively unharmed, but his M3 had been reduced to a depressing, crumpled heap. That first car (also a Technoviolet) was Carlos’ first run at building the E36 of his dreams. He had worked to address all of its issues, from electrical to simply ditching the awful 19” wheels it had come with. 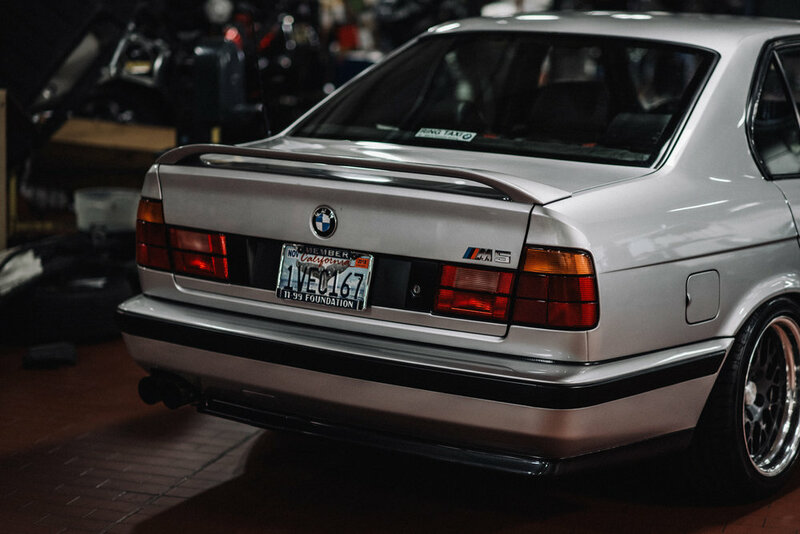 Lightly modded and sitting on BBS LMs, the M3 was the start of Carlos’ Techno journey. It never quite sat right with him once he lost the car. He felt as though his work had been taken from him, unfinished, and it ate at his subconscious. Fast forward nine years later from his first wrecked M3, and Carlos found himself driving an E46 M3, similarly modified with suspension and BBS LMs (noticing a wheel trend here?). Next came his E30 M3, which he refers to as “a project indefinite,” and finally, his true gem: the ’96 Technoviolet seen here. Carlos found this car back in April of last year in the form of a rather cosmetically lacking but promising project. 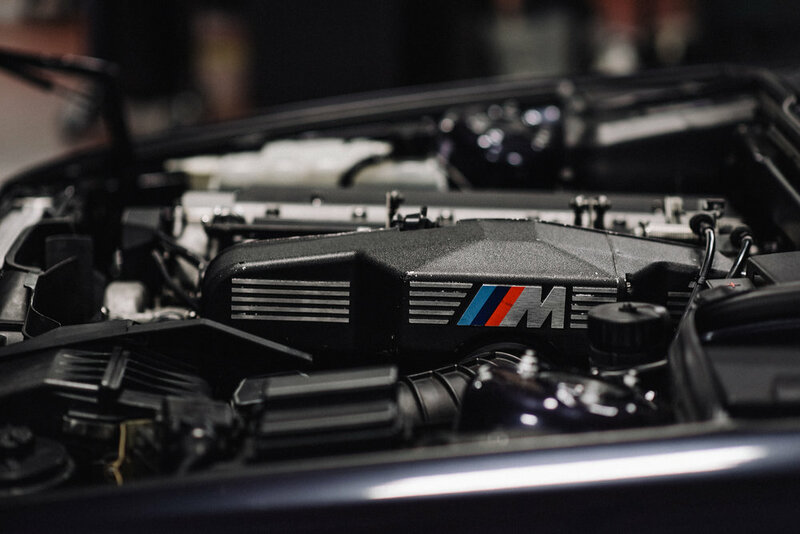 The M3 had been owned by Dinan for most of its life, and was actually the same car that they developed their OBDII supercharger kit on. Carlos came to meet this car’s electrical and cosmetic issues, much like his previous E36. However, this M3 would be different, and would allow a much clearer path for Carlos’ ideas to flourish. For starters: the exterior. A beautiful, well done Technoviolet Metallic respray was needed to repair its state of cosmetic unrest. Carlos bumped into some rust repair along the way, and outfitted the car with some great aero pieces: OEM GT front splitter, Abrahams Motorsport LTW spoiler, and MSportParts wickerbills. I knew what direction I wanted to take the build—to basically build it the way I had always envisioned my first E36 to be. I just lacked the time and resources back then. The M3 sits atop a square set of 18” x 9.5” BBS LMs, wrapped tastefully with Michelin Piolet Sport 2 rubber. The car rides on Ground Control coilovers with corresponding GC camber plates, poly bushings, and Dinan front + rear strut bars. 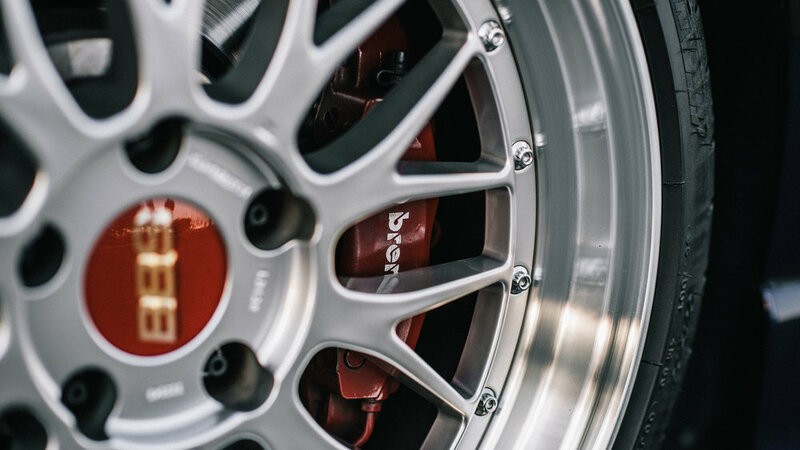 To top it off with braking performance, behind the LM faces you’ll find Porsche Carrera “Big Reds” + Rally Road adaptor brackets and E46 M3 CSL floating front and rear rotors. 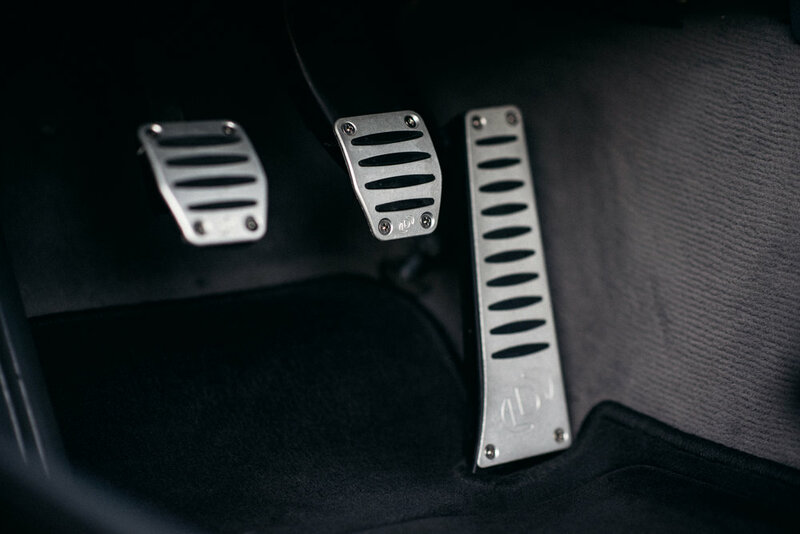 A host of other Dinan bits can be found throughout the build, including Dinan pedals, short shifter, throttle body, v2 Vortech supercharger, software, and v2 stainless exhaust. 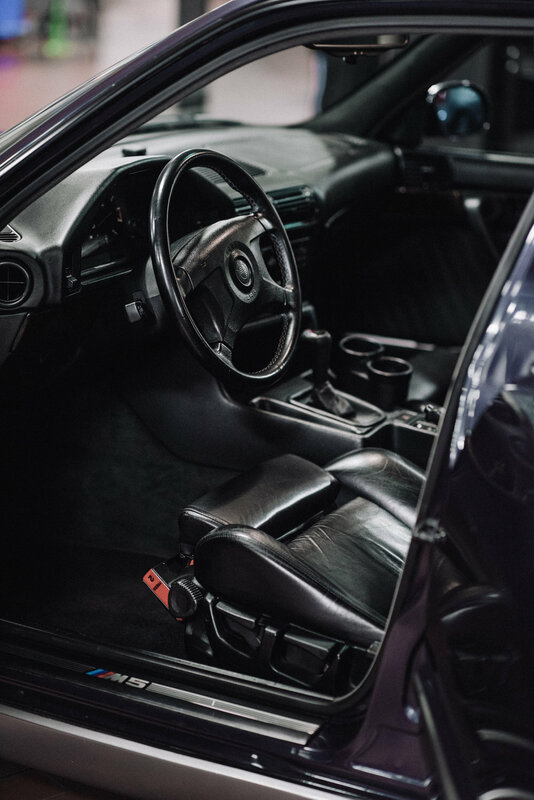 One of our favorite parts about the car rests within the interior. 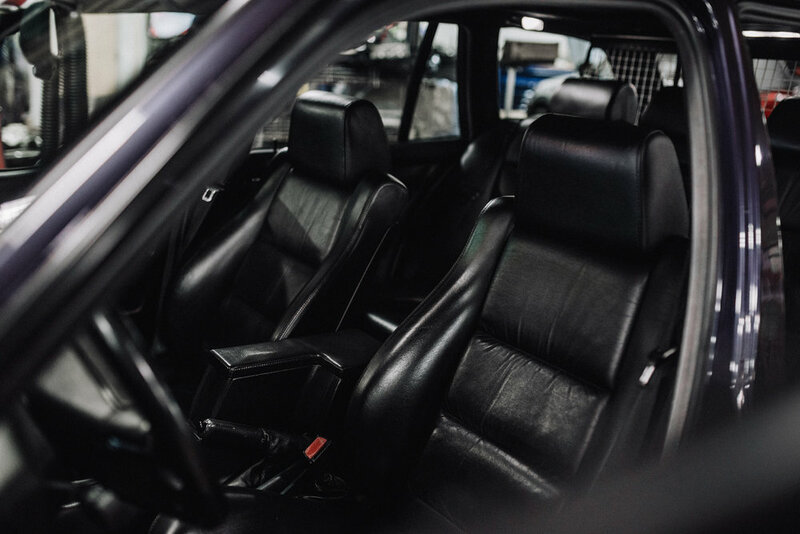 With factory M-Rain front and rear seats, a Euro steering wheel, and alcantara accents (pillars and headliner), the view from the driver seat is spectacular. Every single element of this build works together seamlessly, and it’s easy to see why Carlos was so determined to reunite with the E36 chassis after his first loss. 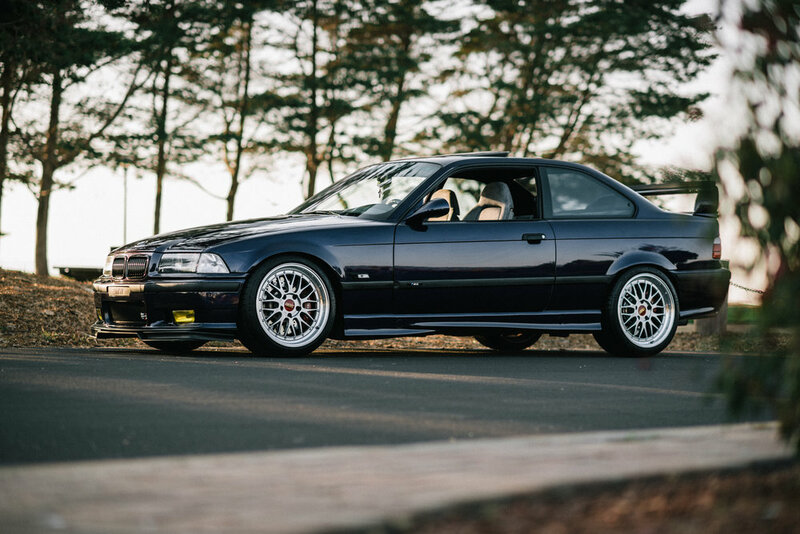 The E36 M3 is becoming increasingly coveted and even BMW themselves consider the car a classic. It’s really the last M car with what you could call “minimal” technology. As beloved as the E46 is, the cult following of its predecessor continues to grow, and we may see a dramatic market change in the coming years. After all, it’s already begun. There are few cars which fall within the caliber of Carlos’ Techno, and with such a long, personal story, it’s truly a special build. 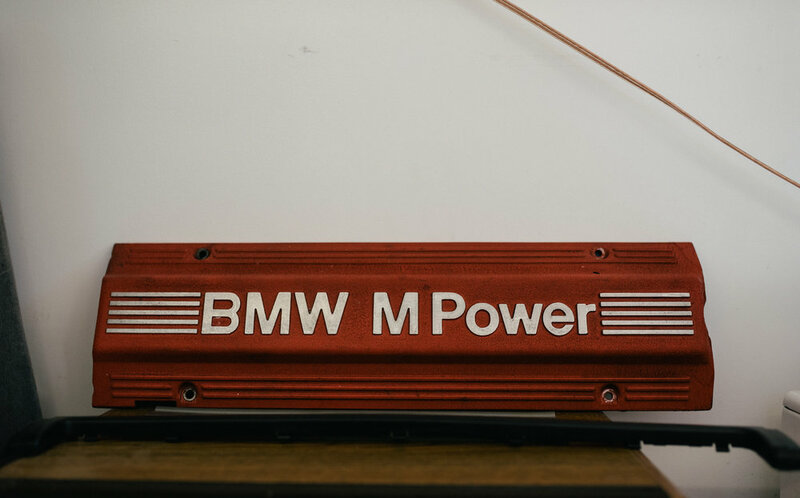 We look forward to seeing what other projects may be in his future, and we might even get some camera time with his E30 M3 some time. There are car enthusiasts, and there are people like Michael Ottati. The distinction here is that Mike takes his love of cars several steps further than the simple label of “enthusiast.” Talking to Mike reveals an incredible wealth of knowledge, some of which would be difficult to find even on the Internet. His anecdotes transport you to other places and times, all vibrant and very personable, as many car stories can be. We met up with Mike and his two sons, Joe and Dom, several months ago to begin documenting their stories. Seeing what we considered to be a vault of valuable stories and insight, we decided to make our best attempt at bringing these things to the light of the community. 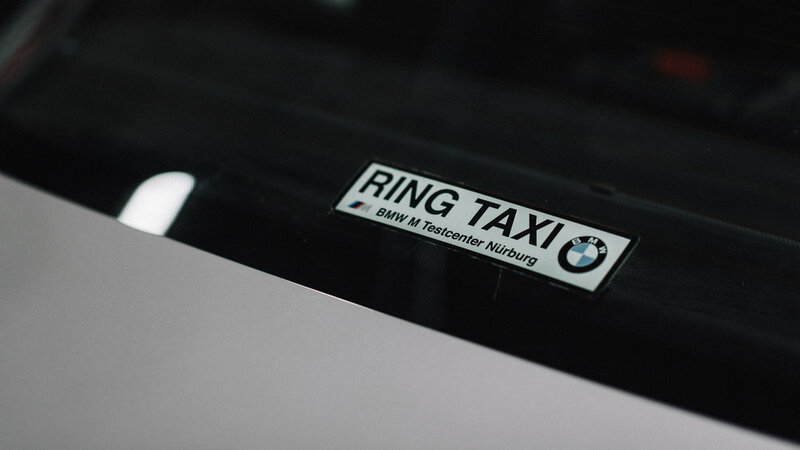 We understand how connected the BMW world can be, and how it can bring together so many people with similar interests and unique experiences. If we can share even a small fraction of these great stories, we will have accomplished our goal. 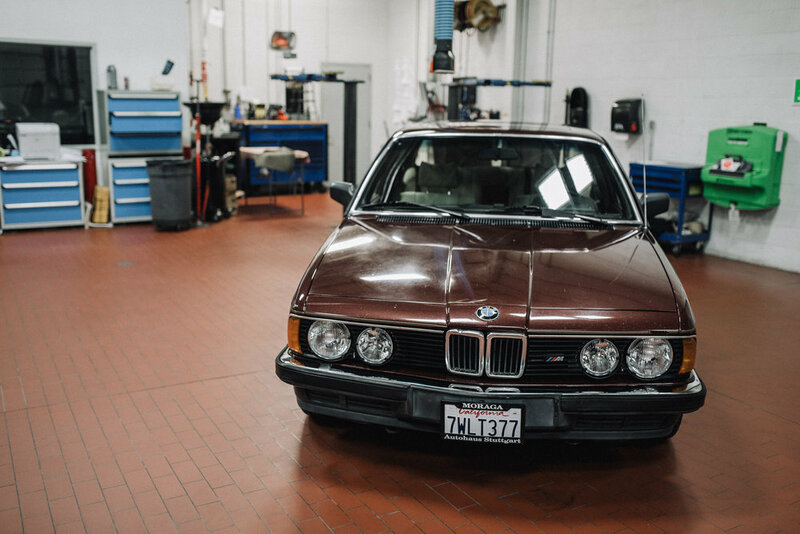 We recently concluded our series of photo coverage on a few of Mike’s vehicles: starting with a look inside the Ottati garage earlier this year, and ending at the BMW Concord service facility. With a special thanks to Greg at BMW Concord for opening the location to us, we were able to showcase three vehicles in a setting which very perfectly complemented the cars and their histories. Mike grew up adoring all things with wheels. He can recall his childhood obsession with Hot Wheels and the go karts from Sears catalogs. At this young age, he soaked in every automotive experience he could, and has fond memories even of his parents’ 1967 Pontiac LeMans. This car would later come to an unfortunate crossroad, suffering from fatal overheating on the freeway. However, it also became Mike’s first “project” car, from which he learned to build and maintain by the age of 16. In addition, he spent much of his time taking care of his parents’ future cars by performing necessary maintenance, and modifying that old Pontiac from his childhood. Those who come from backgrounds of having less tend to have a thorough understanding of taking care of what they have, and making it last. Mike identifies with this mindset, and gives credit to it for helping him appreciate the art of maintaining old vehicles, rather than simply running them into the ground. He also developed a sense of curiosity with regard to what his vehicles had the potential to do. Throughout his high school and early college years, he found himself thriving in his work as a detailer at the father of a friend’s shop. Eventually another company took over the detailing facility and expanded its locations, reaching out to BMW Concord and East Bay BMW. This work brought Mike beyond the tasks of detailing Buicks to prepping new cars, applying pin striping, and heading other detailing packages. He held this job through college, and took great pride in the work he did there. Over time, Mike’s fascination and love of BMW came to light in the form of his first BMW: a 1994 318i. Life proceeded as it always does, and the years passed by, bringing more experiences to further draw him in to the world of BMW. 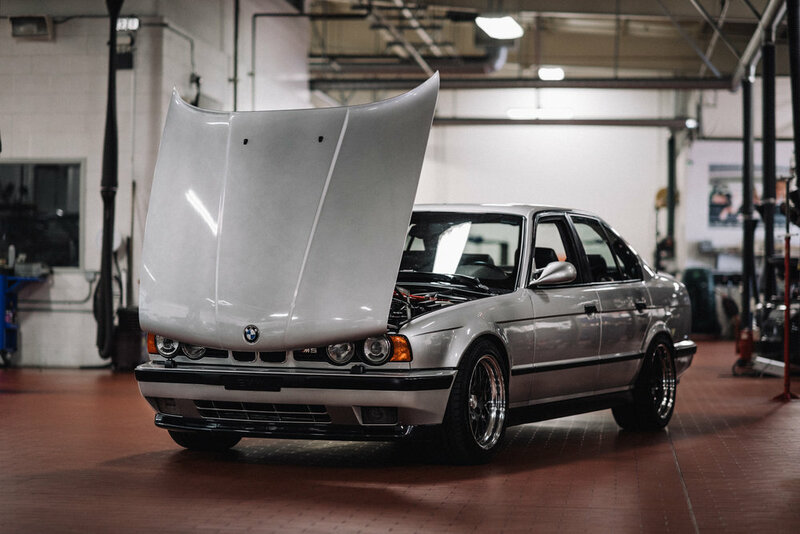 From his first drive in an E34 M5 to an adolescent race with an E28 M5, the idea of a four door road runner captivated him. Fast forward throughout the timeline of building a family with his wife, and you will find that Mike went through quite a few BMWs. His first son warranted a larger E34 525 wagon to give more space than the 318 offered. This car was outfitted with Dinan Stage 3 suspension for a little extra performance on the track, for the few times it went. When their second child was born, his wife got an SUV and he opted to order an early E46 sedan. However, he was given a loaner E39 528i Sport during a service appointment for the E46, and loved it so much that he simply never picked up the E46. He purchased one of the CPO E39s and his wife loved the car so much that they ordered an E39 wagon for her. However, child number three came along and the E39 became impractical; an incident at which his wife cried when they couldn’t fit three car seats in the back. 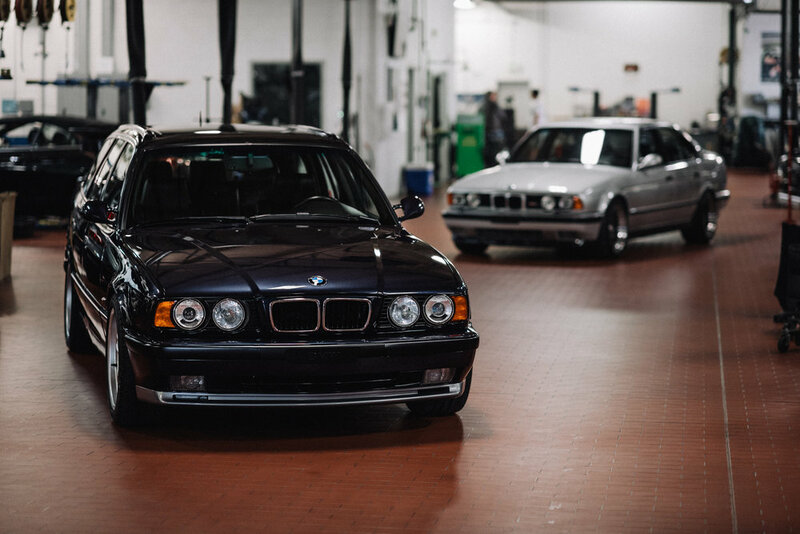 Now we’re brought to the present with the three cars featured in this story: two E34 M5s and a very unique E23. The silver sedan needed some work when Mike acquired it, but not anything major. He went through some suspension refreshment and interior clean up to make it a great turnkey car. The Touring is a very unique and rare example, and Mike often finds himself with curious onlookers, skeptical of the M5 badge on a Touring. “Even in Monterey last summer," he recalled, "I’d get people asking, ‘Who did the swap?’ or ‘I have one just like this at home, but oh… yours is a stick?’” The car is a made-to-order, one of four in its color (Madeira Schwarz), and one of its previous owners ran a Porsche facility at the Nurburgring. This leads us to fantasize that this car indeed made it around the 'Ring a time or two. Early on in his ownership of the car, Mike went through with some paint cleanup, EDC rebuild, and other maintenance. We assisted with some of the deeper mechanical work, but he handled a lot of the details in his own garage. The E23 is a recent venture of the Ottatis’, a truly home built, grassroots project. Mike managed to acquire the M88 transplant before he really even knew what it would be going into. The idea happened as the result of a brainstorm when he was planning the E23’s future. 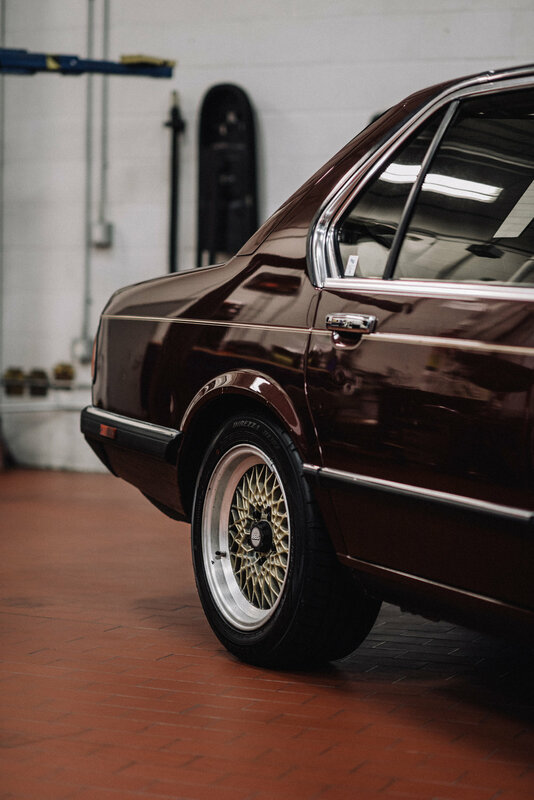 All original paint, interior, and period wheels make this car a true sleeper. However, if you get the chance to listen to the sedan drive by, a trained ear will note that something just isn’t quite normal. 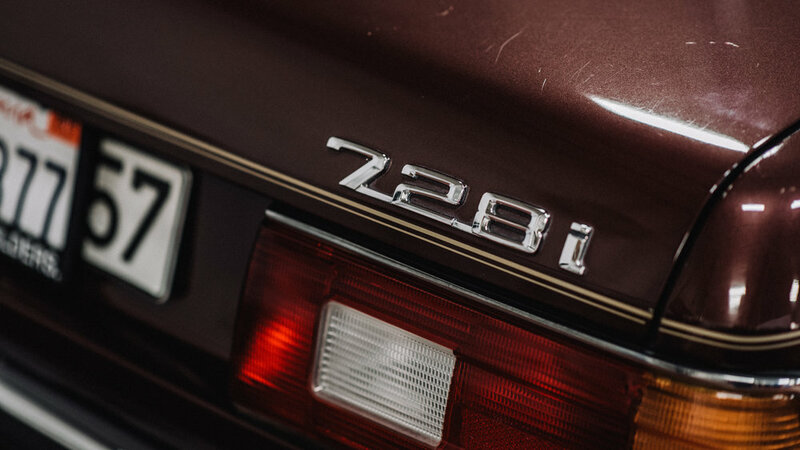 Euro spec goodness is what you'll find inside this E23. 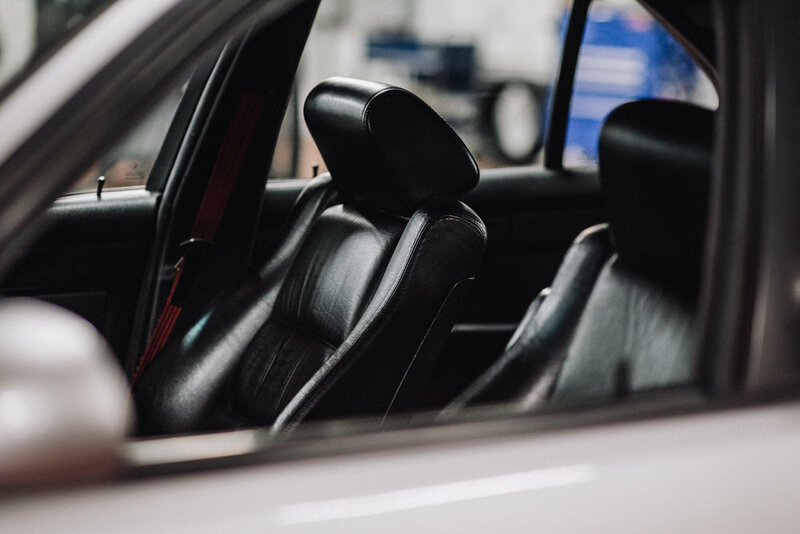 It's defined with wonderfully original cloth interior (wood trim only on the doors), and complete with retro features such as the six cassette holder in the center console. 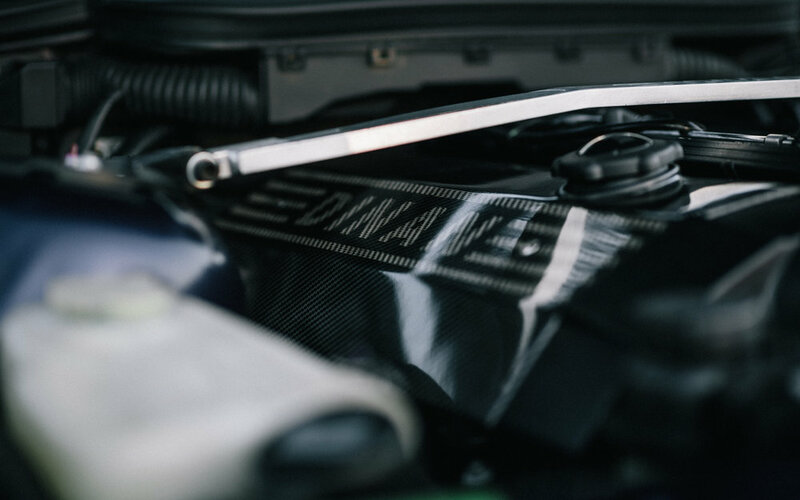 A manual transmission makes the car leagues more fun to drive, and you can even still find the factory first aid kit in the rear seat arm rest. Mike has made it a custom to involve his family in his automotive endeavors. It’s a classic notion for father and son to tinker on that old car in the garage over the years, but Mike and his sons, Dom and Joe, have put their own twist on the tradition. From E36 M3s, multiple E34s, E30s, E23s, E28s, E39s, Mercedes 123 wagons and more, Mike has introduced the undeniable “car bug” to his sons. His daughter helps out with minor maintenance and even promises that she’ll drive a stick when she’s older. Among many things, we have a great respect and admiration for Mike, his mindset, and his practice. He is a prime example of a true family man, who despite the hustle of everyday life, can still make his automotive passion work. 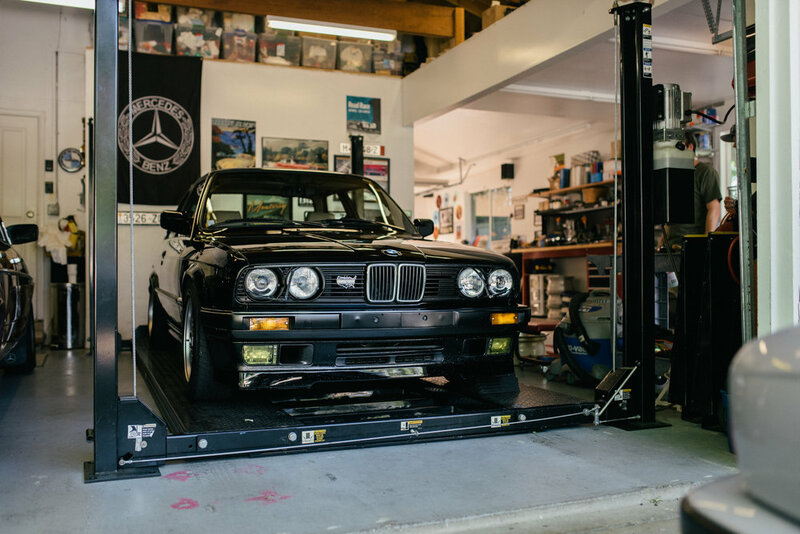 Not only does it work, but it thrives through his sons as well, as they get to learn so many valuable lessons in their own garage. We look forward to seeing more beautiful cars from the Ottati family in the future.